Back in the 1990s, four Americans swam the 3 km between the closest points between Bali (northernmost point on White Beach) to Java. After two Americans crossed in 1996 in 2 hours, International Swimming Hall of Fame Honor Swimmer David Yudovin had set the record in 1 hour 36 minutes in 1997. But then Monte Monfore made his first attempt at a charity swim for causes in July 1998. It was to set off a decade of goodwill swims. He sure was. Monfore swam between the two islands in 38 minutes. 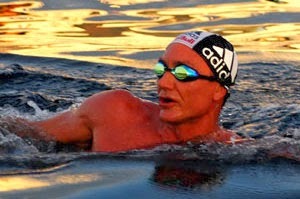 His rapid crossing set in place another decade of charity swims on a variety of causes.